Preheat the oven to 100C. 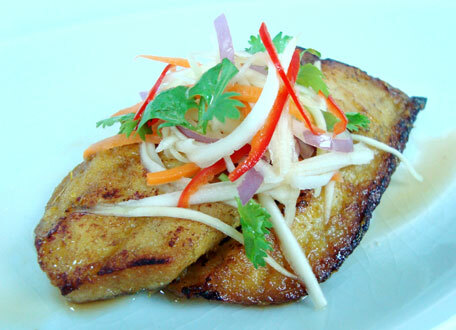 Marinate seabass with turmeric, coconut milk, soy sauce and honey then bake for 10 minutes or until medium cooked. Set aside. To prepare dressing, whisk soy sauce, honey, lime juice and chilli in a bowl until well mixed. Add all remaining relish ingredients to the bowl with the dressing. Gently toss until evenly mixed. Arrange the baked seabass on the centre of plate, put the green mango relish on top of the fish, and sprinkle with coriander leaves.